4 so that you may realize the certainty of the teachings you have received. 5 2 In the days of Herod, King of Judea, 3 there was a priest named Zechariah of the priestly division of Abijah; his wife was from the daughters of Aaron, and her name was Elizabeth. 6 Both were righteous in the eyes of God, observing all the commandments and ordinances of the Lord blamelessly. 7 But they had no child, 4 because Elizabeth was barren and both were advanced in years. 9 according to the practice of the priestly service, he was chosen by lot to enter the sanctuary of the Lord to burn incense. 11 the angel of the Lord appeared to him, standing at the right of the altar of incense. 12 Zechariah was troubled by what he saw, and fear came upon him. 13 But the angel said to him, “Do not be afraid, 5 Zechariah, because your prayer has been heard. Your wife Elizabeth will bear you a son, and you shall name him John. 19 And the angel said to him in reply, “I am Gabriel, 8 who stand before God. I was sent to speak to you and to announce to you this good news. 22 But when he came out, he was unable to speak to them, and they realized that he had seen a vision in the sanctuary. He was gesturing to them but remained mute. 23 Then, when his days of ministry were completed, he went home. 27 to a virgin betrothed to a man named Joseph, of the house of David, and the virgin’s name was Mary. 38 Mary said, “Behold, I am the handmaid of the Lord. May it be done to me according to your word.” Then the angel departed from her. 43 And how does this happen to me, that the mother of my Lord 14 should come to me? 57 17 When the time arrived for Elizabeth to have her child she gave birth to a son. 68 19 “Blessed be the Lord, the God of Israel, for he has visited and brought redemption to his people. 1 [1-4] The Gospel according to Luke is the only one of the synoptic gospels to begin with a literary prologue. Making use of a formal, literary construction and vocabulary, the author writes the prologue in imitation of Hellenistic Greek writers and, in so doing, relates his story about Jesus to contemporaneous Greek and Roman literature. 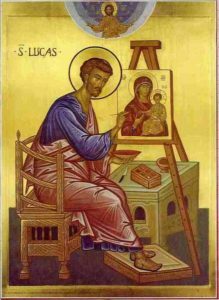 Luke is not only interested in the words and deeds of Jesus, but also in the larger context of the birth, ministry, death, and resurrection of Jesus as the fulfillment of the promises of God in the Old Testament. As a second- or third-generation Christian, Luke acknowledges his debt to earlier eyewitnesses and ministers of the word, but claims that his contribution to this developing tradition is a complete and accurate account, told in an orderly anner, and intended to provide Theophilus (“friend of God,” literally) and other readers with certainty about earlier teachings they have received. 2 [⇒ 1:5-⇒ 2:52] Like the Gospel according to Matthew, this gospel opens with an infancy narrative, a collection of stories about the birth and childhood of Jesus. The narrative uses early Christian traditions about the birth of Jesus, traditions about the birth and circumcision of John the Baptist, and canticles such as the Magnificat (⇒ Luke 1:46-55) and Benedictus (⇒ Luke 1:67-79), composed of phrases drawn from the Greek Old Testament. It is largely, however, the composition of Luke who writes in imitation of Old Testament birth stories, combining historical and legendary details, literary ornamentation and interpretation of scripture, to answer in advance the question, “Who is Jesus Christ?” The focus of the narrative, therefore, is primarily christological. In this section Luke announces many of the themes that will become prominent in the rest of the gospel: the centrality of Jerusalem and the temple, the journey motif, the universality of salvation, joy and peace, concern for the lowly, the importance of women, the presentation of Jesus as savior, Spirit-guided revelation and prophecy, and the fulfillment of Old Testament promises. The account presents parallel scenes (diptychs) of angelic announcements of the birth of John the Baptist and of Jesus, and of the birth, circumcision, and presentation of John and Jesus. In this parallelism, the ascendency of Jesus over John is stressed: John is prophet of the Most High (⇒ Luke 1:76); Jesus is Son of the Most High (⇒ Luke 1:32). John is great in the sight of the Lord (⇒ Luke 1:15); Jesus will be Great (a LXX attribute, used absolutely, of God) (⇒ Luke 1:32). John will go before the Lord (⇒ Luke 1:16-17); Jesus will be Lord (⇒Luke 1:43; ⇒ 2:11). 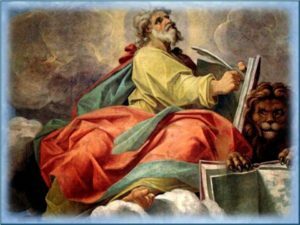 3  In the days of Herod, King of Judea: Luke relates the story of salvation history to events in contemporary world history. Here and in ⇒ Luke 3:1-2 he connects his narrative with events in Palestinian history; in ⇒ Luke 2:1-2 and ⇒ Luke 3:1 he casts the Jesus story in the light of events of Roman history. Herod the Great, the son of the Idumean Antipater, was declared “King of Judea” by the Roman Senate in 40 B.C., but became the undisputed ruler of Palestine only in 37 B.C. He continued as king until his death in 4 B.C. Priestly division of Abijah: a reference to the eighth of the twenty-four divisions of priests who, for a week at a time, twice a year, served in the Jerusalem temple. 4  They had no child: though childlessness was looked upon in contemporaneous Judaism as a curse or punishment for sin, it is intended here to present Elizabeth in a situation similar to that of some of the great mothers of important Old Testament figures: Sarah (⇒ Genesis 15:3; ⇒ 16:1); Rebekah (⇒ Genesis 25:21); Rachel (⇒ Genesis 29:31; ⇒ 30:1); the mother of Samson and wife of Manoah (⇒ Judges 13:2-3); Hannah (⇒ 1 Sam 1:2). 5  Do not be afraid: a stereotyped Old Testament phrase spoken to reassure the recipient of a heavenly vision (⇒ Genesis 15:1; ⇒ Joshua 1:9; ⇒ Daniel 10:12, ⇒ 19 and elsewhere in ⇒ Luke 1:30; ⇒ 2:10). You shall name him John: the name means “Yahweh has shown favor,” an indication of John’s role in salvation history. 6  He will drink neither wine nor strong drink: like Samson (⇒ Judges 13:4-5) and Samuel (⇒ 1 Sam 1:11 LXX and 4QSama), John is to be consecrated by Nazirite vow and set apart for the Lord’s service. 8  I am Gabriel: “the angel of the Lord” is identified as Gabriel, the angel who in ⇒ Daniel 9:20-25 announces the seventy weeks of years and the coming of an anointed one, a prince. By alluding to Old Testament themes in ⇒ Luke 1:17, ⇒19 such as the coming of the day of the Lord and the dawning of the messianic era, Luke is presenting his interpretation of the significance of the births of John and Jesus. 9  You will be speechless and unable to talk: Zechariah’s becoming mute is the sign given in response to his question in v 18. When Mary asks a similar question in ⇒ Luke 1:34, unlike Zechariah who was punished for his doubt, she, in spite of her doubt, is praised and reassured(⇒ Luke 1:35-37). 10 [26-38] The announcement to Mary of the birth of Jesus is parallel to the announcement to Zechariah of the birth of John. In both the angel Gabriel appears to the parent who is troubled by the vision (⇒ Luke 1:11-12, ⇒ 26-29) and then told by the angel not to fear (⇒ Luke 1:13, ⇒ 30). After the announcement is made (⇒ Luke 1:14-17, ⇒ 31-33) the parent objects (⇒ Luke 1:18, ⇒ 34) and a sign is given to confirm the announcement (⇒ Luke 1:20, ⇒ 36). The particular focus of the announcement of the birth of Jesus is on his identity as Son of David (⇒ Luke 1:32-33) and Son of God (⇒ Luke 1:32, ⇒ 35). 11  Son of the Most High: cf ⇒ Luke 1:76 where John is described as “prophet of the Most High.” “Most High” is a title for God commonly used by Luke (⇒ Luke 1:35, ⇒ 76; ⇒ 6:35; ⇒ 8:28; ⇒ Acts 7:48; ⇒ 16:17). 12  Mary’s questioning response is a denial of sexual relations and is used by Luke to lead to the angel’s declaration about the Spirit’s role in the conception of this child (⇒ Luke 1:35). According to Luke, the virginal conception of Jesus takes place through the holy Spirit, the power of God, and therefore Jesus has a unique relationship to Yahweh: he is Son of God. 13 [36-37] The sign given to Mary in confirmation of the angel’s announcement to her is the pregnancy of her aged relative Elizabeth. If a woman past the childbearing age could become pregnant, why, the angel implies, should there be doubt about Mary’s pregnancy, for nothing will be impossible for God. 14  Even before his birth, Jesus is identified in Luke as the Lord. 15  Blessed are you who believed: Luke portrays Mary as a believer whose faith stands in contrast to the disbelief of Zechariah (⇒ Luke 1:20). Mary’s role as believer in the infancy narrative should be seen in connection with the explicit mention of her presence among “those who believed” after the resurrection at the beginning of the Acts of the Apostles (⇒ Acts 1:14). 16 [46-55] Although Mary is praised for being the mother of the Lord and because of her belief, she reacts as the servant in a psalm of praise, the Magnificat. Because there is no specific connection of the canticle to the context of Mary’s pregnancy and her visit to Elizabeth, the Magnificat (with the possible exception of v 48) may have been a Jewish Christian hymn that Luke found appropriate at this point in his story. Even if not composed by Luke, it fits in well with themes found elsewhere in Luke: joy and exultation in the Lord; the lowly being singled out for God’s favor; the reversal of human fortunes; the fulfillment of Old Testament promises. The loose connection between the hymn and the context is further seen in the fact that a few Old Latin manuscripts identify the speaker of the hymn as Elizabeth, even though the overwhelming textual evidence makes Mary the speaker. 17 [57-66] The birth and circumcision of John above all emphasize John’s incorporation into the people of Israel by the sign of the covenant (⇒ Genesis 17:1-12). The narrative of John’s circumcision also prepares the way for the subsequent description of the circumcision of Jesus in ⇒ Luke 2:21. At the beginning of his two-volume work Luke shows those who play crucial roles in the inauguration of Christianity to be wholly a part of the people of Israel. At the end of the Acts of the Apostles (⇒ Acts 21:20; ⇒ 22:3; ⇒ 23:6-9; ⇒ 24:14-16; ⇒ 26:2-8, ⇒ 22-23) he will argue that Christianity is the direct descendant of Pharisaic Judaism. 18  The practice of Palestinian Judaism at this time was to name the child at birth; moreover, though naming a male child after the father is not completely unknown, the usual practice was to name the child after the grandfather (see ⇒ Luke 1:61). The naming of the child John and Zechariah’s recovery from his loss of speech should be understood as fulfilling the angel’s announcement to Zechariah in ⇒ Luke 1:13, ⇒ 20. 19 [68-79] Like the canticle of Mary (⇒ Luke 1:46-55) the canticle of Zechariah is only loosely connected with its context. Apart from ⇒ Luke 1:76-77, the hymn in speaking of a horn for our salvation (⇒ Luke 1:69) and the daybreak from on high (⇒ Luke 1:78) applies more closely to Jesus and his work than to John. Again like Mary’s canticle, it is largely composed of phrases taken from the Greek Old Testament and may have been a Jewish Christian hymn of praise that Luke adapted to fit the present context by inserting ⇒ Luke 1:76-77 to give Zechariah’s reply to the question asked in ⇒ Luke 1:66. 21  You will go before the Lord: here the Lord is most likely a reference to Jesus (contrast ⇒ Luke 1:15-17 where Yahweh is meant) and John is presented as the precursor of Jesus. 22  The daybreak from on high: three times in the LXX (⇒ Jeremiah 23:5; ⇒ Zechariah 3:8; ⇒ 6:12), the Greek word used here for daybreak translates the Hebrew word for “scion, branch,” an Old Testament messianic title. This entry was posted in BIBLE - NEW TESTAMENT - Sacra - Novum Testamentum, LUKE, THE BIBLE - LA BIBBIA - LA BIBLIA -A BÍBLIA - 圣经 - 聖書 - BIBLIA. Bookmark the permalink.